Hint: Point other readers to any section of this page with the web address + #hashtag of the header keyword. Example: http://epress.trincoll.edu/webwriting/chapter/how-to-google-docs/#advanced. This tutorial illustrates how to co-author and peer edit with Google Documents. You are welcome to freely share this guide with others (such as a class of students), modify it to match your specific needs, and report back on your results in the comments section below. Although some schools subscribe to Google Apps for Education to offer more control over how educators and students access Google Docs, this tutorial addresses features found in the regular free version of Google Drive for individual users. Sign up for a free Google Drive account using your existing Google email address, or create a new account. If you wish to maintain some privacy when using Google Docs in my class, create an account that displays only your first name or a pseudonym, and inform me that you’re using it, following the principles described in my “Public Writing and Student Privacy” essay in this volume. To compose an essay in Google Docs, select the New button. 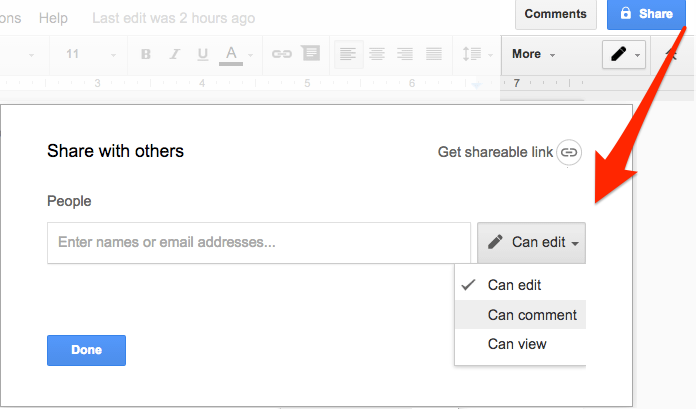 If someone shares a Google Doc and allows you to comment, there are two ways to add feedback. In either case, the GDoc owner may accept, reject, or respond to your comments and suggestions. If you wish to receive credit for your comments and suggestions, make sure you are signed into your account when entering them, or else they will appear anonymously. 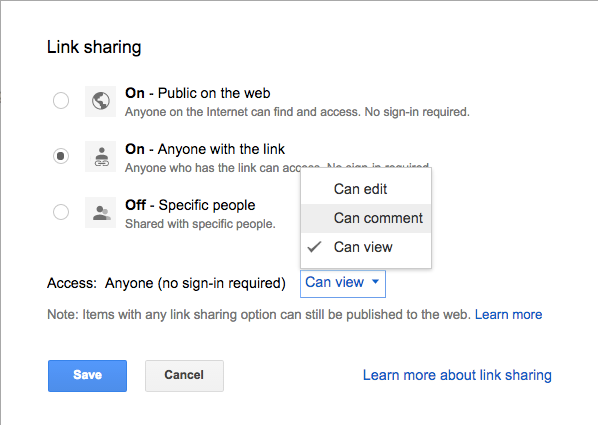 By default, Google Docs are set to “private.” Change the Share settings to allow others to view, comment, or edit. To invite individual users to your Google Doc, click the Share button, add their usernames, and assign their privileges to view, or comment on, or edit. By default, your document will NOT be viewable by others. Click the Share button and invite individual users. Click the Share button and “Advanced” for Link Sharing. 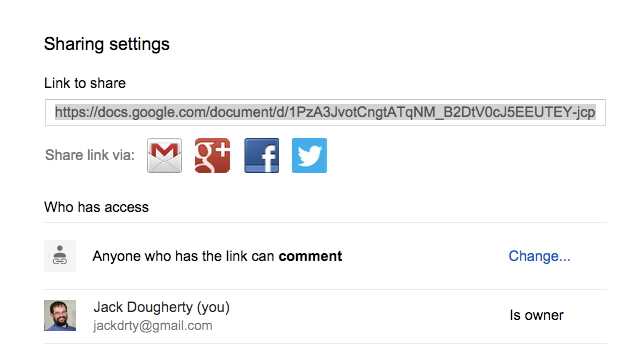 How can you tell if you correctly set your sharing settings to “Anyone with the link can comment”? Open a different web browser that is NOT logged into your personal Google Drive account. (For example, my Chrome browser is always logged into my Google Drive account, but my Firefox browser is not.) Paste the link to your shared Google Doc into your second browser, and if it appears and accepts comments (or the green “Suggesting” mode button appears), you correctly shared it. The instructor has the option to restrict access to the organizer page to specific individuals, such as members of our class. In addition, you also can share the link to your Google Doc via email, web pages, and social media. 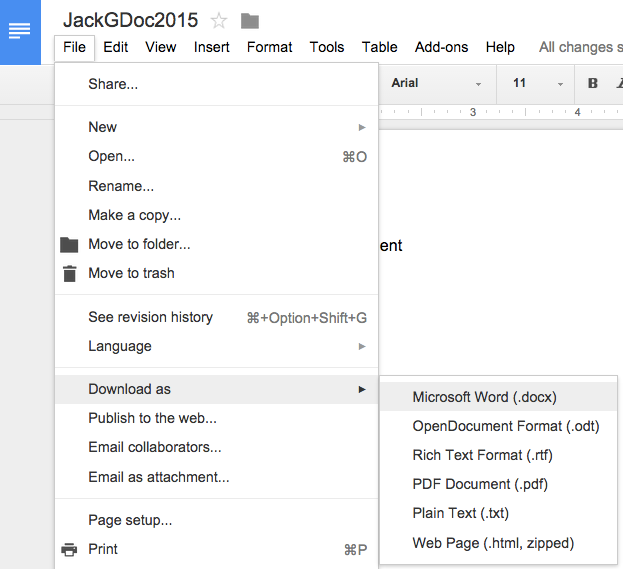 Copy and paste your GDoc link on a peer editing page. Copy the long link to share your Google Document with others. Google Doc web addresses are very long. To create a customized easy-to-remember link to share with others, subscribe to a free link shortening tool, such as http://bit.ly or http://TinyURL.com. If you compose essays in a different word processor (such as MS Word or LibreOffice), you can upload and convert them to share with others in Google Docs. 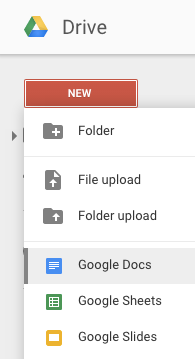 Go to your Google Drive settings (the gear symbol) and check the box to “Convert Uploads” into Google Docs format. To export a Google Document in a different format, select File > Download As to choose your options, such as Microsoft Word (.docx) and others. If your Google Doc has comments from others, most will appear in the MS Word export in “Track Changes” format. Jack Dougherty, “How to Co-Author and Peer Edit with Google Docs,” in Web Writing: Why and How for Liberal Arts Teaching and Learning (University of Michigan Press/Trinity College ePress edition, 2015), http://epress.trincoll.edu/webwriting/chapter/how-to-google-docs. How to Co-Author and Peer Edit with Google Docs by Jack Dougherty is licensed under a Creative Commons Attribution-NonCommercial-NoDerivatives 4.0 International License, except where otherwise noted.